It may be boiling outside now, but it’s going to start cooling off in the next couple months. It’s important that you make sure your heating system is in good condition, in preparation for the coming heating season. Maintenance is part of that, but it’s not the whole story. Duct sealing is an important part of keeping your heating system in the best possible operating condition. Let’s take a look at how duct sealing works, and how it can benefit you this year. Get Ready for Summer with Duct Sealing! Summer is almost here, and you’re probably already busy getting your home ready for the coming heat. You have very likely already scheduled air conditioning maintenance to make sure that your system is ready to cope with the added strain. However, that’s not the only thing you can do to make sure that your air conditioner is ready for summer. Read on to find out how duct sealing can help make your air conditioner more efficient. Posted in Indoor Air Quality | Comments Off on Get Ready for Summer with Duct Sealing! Fall is here, and while most of us probably won’t be turning on our heating systems for a couple more months, it’s still a good idea to prepare for winter. When you think about getting your home ready for the cold season, you probably think about things like heating maintenance. While it’s a good idea to make sure that your heater is in good condition, you should also make sure that your ducts are in good condition. Let’s take a look at why you should get your ducts sealed this fall. With summer almost upon us, it’s time to start making sure that your air conditioner is ready for the hottest days of the year. Annual maintenance and timely repairs are obviously both a good idea. However, there is one thing you can do to improve your air conditioner efficiency that most people never think about: duct sealing. Read on to find out more about duct sealing, and how it can help your air conditioner keep you cool this summer. Your ductwork is an integral part of your air conditioning system. When there are cracks, broken seals, or detached sections in your ductwork, you can lose a lot of the air passing through the ducts. 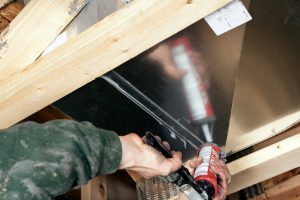 Duct cleaning can eliminate obstructions from dust and dirt, but to truly get your ductwork into the best shape possible, you may want to consider duct sealing in Lake City. Sealing ducts increases your energy efficiency tremendously by reducing and/or eliminating air loss in your ductwork. This, in turn, reduces your energy bill, which can help you save money. Leaky ductwork can allow multiple types of particles into your HVAC system, including allergens, dust and dirt. By sealing the ductwork, you can effectively reduce the amount of particles entering your system. Leaky air ducts can contribute to the creation of hot and cold spots throughout a home. Reinstating a healthy, consistent flow of air to your home can help eliminate uneven cooling. Gas appliances, such as dryers, water heaters and furnaces can release combustion gases through their vent work that can get drawn into your ductwork from a problem known as backdrafting. Sealing your ductwork can greatly reduce the risk of backdrafting in your air conditioner’s system. Sealing faulty ducts helps your system become more energy efficient; when you use less energy, you reduce your carbon footprint. Duct sealing involves a lot: a full inspection of your entire ductwork system, testing of the supply and return vents, checking for backdrafting, and of course, the sealing and repair work. It’s a lot of skilled work, and it is better left to someone with the training to do it. If you think your air conditioning system in Lake City could benefit from duct sealing, call Touchstone Heating and Air, Inc., today and schedule an appointment.